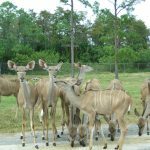 If you are a fan of Walt Disney’s Animal Kingdom you are going to love the Lion Country Safari in West Palm Beach Florida. 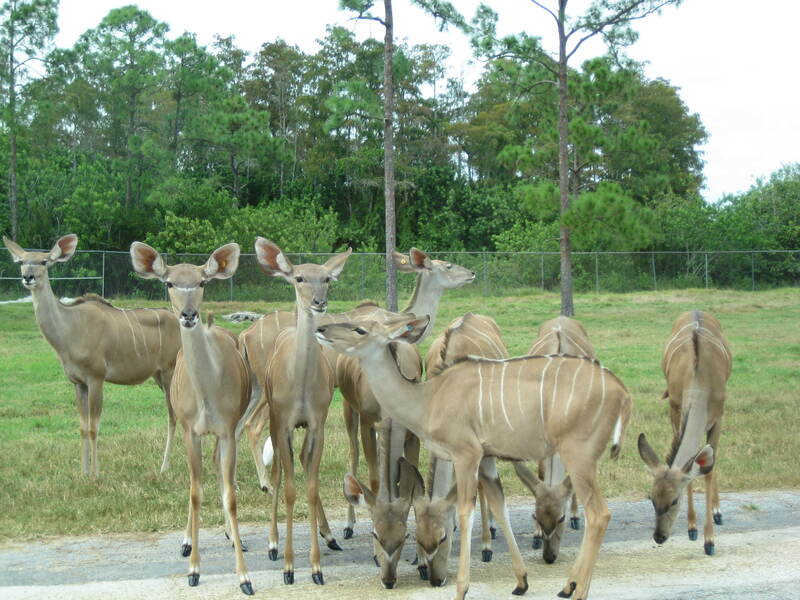 We visited Lion Country Safari early in the afternoon one Saturday. The entrance fee is $26.50 per adult for admission and we prepared to embark in our own car on a pretend drive through a Safari in Africa. 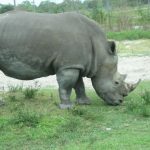 We were told that the animals were more active in the morning as opposed to the time we entered the park, but we were not disappointed with what we saw even in the afternoon. We noticed many signs warning us to drive at 8 mph while in the park and to make sure that we stayed in the car at all times with our doors locked and windows up. There was a line of cars ahead of us as we eagerly awaited our turn to enter the park. We were given a brochure that detailed all the animals and birds we were about to see and audio compact disc (CD) that narrated and explained in detail what we were observing with appropriate in mood music which was befitting our adventure. We entered “Las Pampas” where we observed the adorable Aldabra Tortoise, Pelicans, Rheas and llamas. We were able to slow down and pull to the sides to take wonderful photos. We then entered Ruaha National Park a smaller version of the unspoiled African wilderness known for its variety of wildlife including the Impala, Greater Kudu and Aoudad. Then we approached the Kalahari Bushveldt where we observed the Nile Lechwe and Gemsbok. Then it was time to enter into the Gir Forest where we observed the Kulan, Nilgai, Black Buck and oversized Asiatic Water Buffalo. The highlight for us was the Gorongosa Reserve that featured the Majestic African Lions and his pride. We really slowed our speed for this part because we loved observing these loveable yet fierce cats. 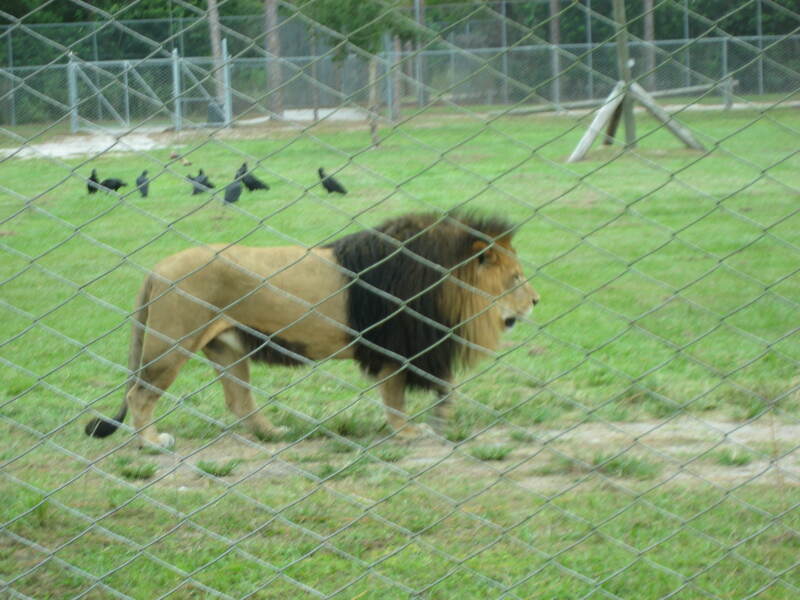 We were a little disappointed that the Lions were fenced in although we knew it was for our protection. Whereas the rest of the park felt like we were on an adventurous Safari, unfortunately this part of the safari felt like we were at a zoo. Once you let your imagination go and see them on the open plains of the Gorongosa Reserve, the Lions seemed to be happy in their large pride. The lions where mostly resting during the heat of the day and there was some minor movements which kept our keen interest. Then we drove on and entered unto the Serengeti Plains where we took great photos of Wildebeest, Waterbuck, Eland, Watusi, Mouflon and lots of Ostriches! The Ostriches were very precocious as they did not hesitate to cross the road in front of our car. One particular Ostrich seemed very curious to see what we were doing when she walked alongside our car while we were trying to take her photo..I thought she might attack but she did not. I must comment that I had never been inches away from an Ostrich before; they are indeed a unique creature! Then it was time to enter into the Hwange National Park this part was great fun and one of the highlights of the park. We observed White-Handed Gibbons which looked like cute little Monkeys, playful Chimpanzees that were separated from our car by a pond, many, many Zebras and the Southern White Rhinoceros. 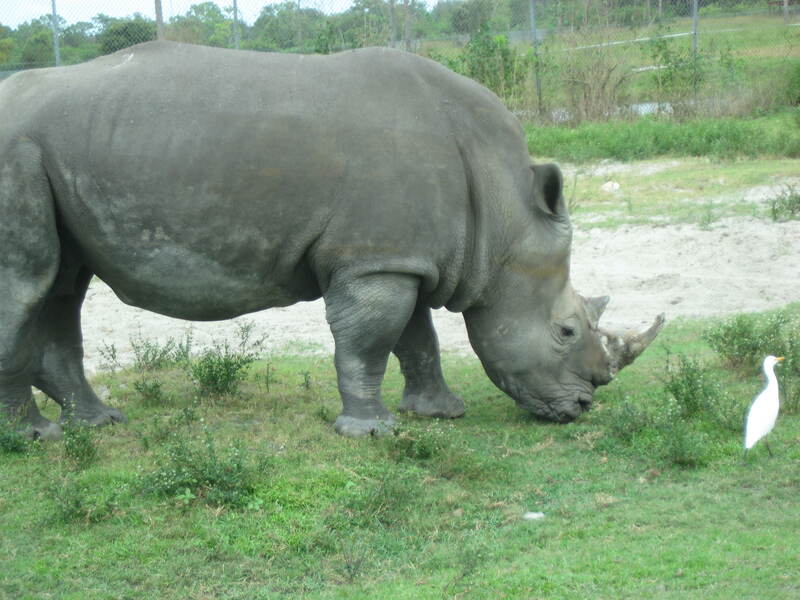 The Rhinos were huge and they were many signs posted not to pull up right next to them as they could charge and damage the car, but that is what we did anyway with our hearts pounding we got amazing up close photos of these extraordinary mammals….I felt as if I could touch them! 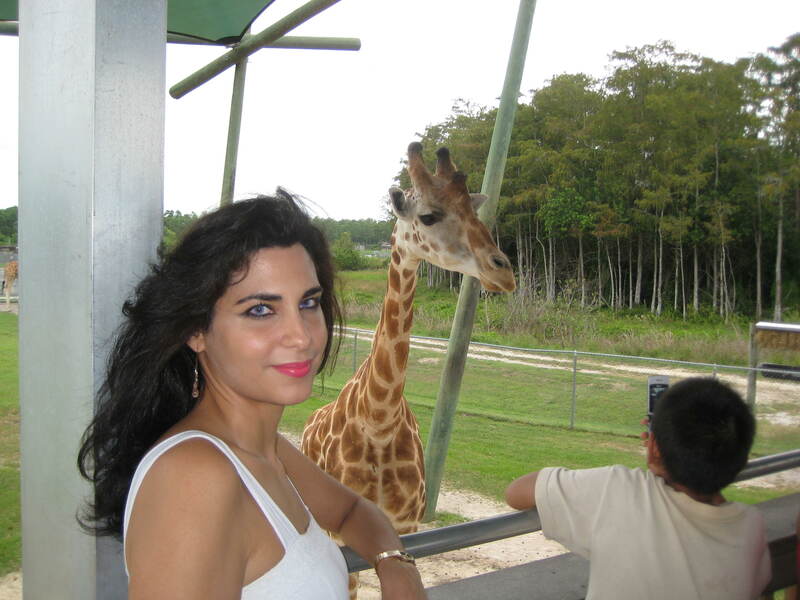 My favorite part and the highlight for me were the Giraffes. 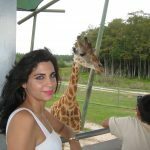 I had been to Busch Gardens where I paid a lot to get a private tour to feed the Giraffe, so I am quite familiar with the experience. Here at Lion Country Safari for a fraction of the price of Busch Gardens, we happened to be in the park at the perfect time where the Giraffes walked inches away from our car to feed. We watched in amazement where they walked a long way to get to where the animal trainer was with the food. One Giraffe was so tall I kept zooming out with my Camera but he was so close I could not get all of him in my screen. This part of the park was definitely a crowd pleaser as many cars stopped behind us to witness this event. I am not sure if anyone is guaranteed to see this as the animals are wild but this was one of the most memorable events at the park. When we were leaving, we were told we could drive around and through the animal habitat again and as many times as we wished until 4:30pm, when that part of the park closed. We had difficulty trying to re-enter the animal park as the signage was very clear on how to exit Lion Country Safari but not on how to re-enter animal habitat. We stopped and asked a friendly park ranger who happily showed us the way. So we drove around again this time taking videos instead of still shots. We went a little faster this time because we knew exactly what we wanted to see more of and we were totally excited to have driven around again. This time around, the Lions were walking and not sleeping, running, roaring and spraying the trees to mark their territories. This is what we had expected to see on the first drive around. I believe the lions to always be the star of the show and we were not disappointed this time around. So word of advice, you may want to drive through the animal habitat at least 2 times if you have the time. 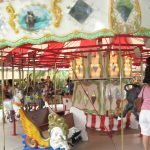 When we were getting ready to exit the animal habitat, we saw children riding a camel in an enclosed amusement area of Lion Country Safari so we wanted to stop and check out this park of the park too. We only had an hour left to see the amusement park with the rides and petting zoo so we had to make it quick. I suggest if visiting the park to give yourself a minimum of 5 hours if you want to maximize your time there and enjoy all it has to offer. We took photos of the Flamingos, came up close to the cute prickly Porcupines, turtles, exotic birds and snakes. The Crocodile at this park is the biggest I have ever seen so I snapped several photos to post on Facebook! We then walked through a maze that proved to be a real brain teaser. 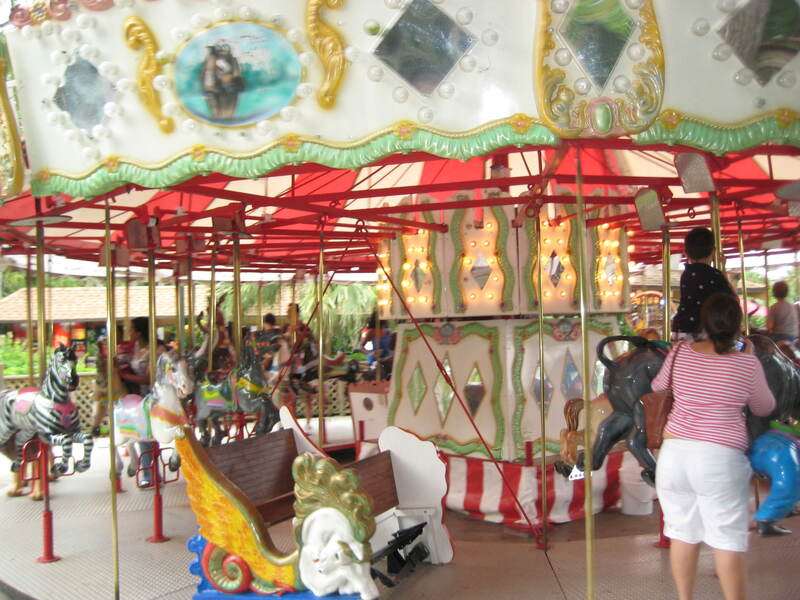 The ride on the decorated Carousel brought back fun memories as I reminisced of my childhood. Although I was a little embarrassed to ride it being a grown up, this feeling quickly passed away as we went round and round. We watched the Ferris Wheel go round, another crowd pleaser. We watched the little kids take rides on the El Paso Train and the Flying Elephant ride…it looked like great fun! Taking a boat ride on the Safari Queen, where you learn about the Siamangs and Spider Monkeys was most educational. We saw many families navigating on the paddleboats and plotting their own adventure. Although we did not indulge in this, it was quite interesting to see the kids panning for gems and stones. Many children dressed in bathing suits to be cooled off in Safari Splash, with 23 interactive water functions and there is also a water slide (opened on weekends and holidays only). Also, there were many guest indulged in a Florida favorite, a round of competitive miniature golf at no extra cost. For a very affordable and small fee, you can enjoy the opportunity to interact with the Lories at the Lory feeding aviary. You can also feed the Giraffe at the feeding area, and can pet both Sheep and Goats at the Petting Zoo. 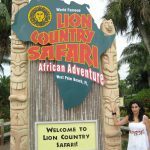 Like all theme parks, there are great items that can be purchased as memorabilia in the gift shops and you can have lunch at an African-themed, cafeteria-style restaurant located inside Safari World. You can be served a variety of items from deli sandwiches, pizza, chicken tenders, burgers, baked chicken, fruit, salads, hot dogs and much more. 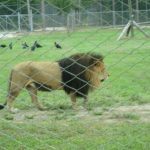 We also observed that the Lion Country Safari would allow events to be hosted in the park…what a great idea to have a party for a child here! All in all, the day was packed with lots of exciting things to do for the entire family, couples and singles…I think you really get the best bang for your buck if you enjoy the drive through animal habitat and the amusement park at Lion Country Safari because most of the rides and amenities are at no extra charge, a great value!! 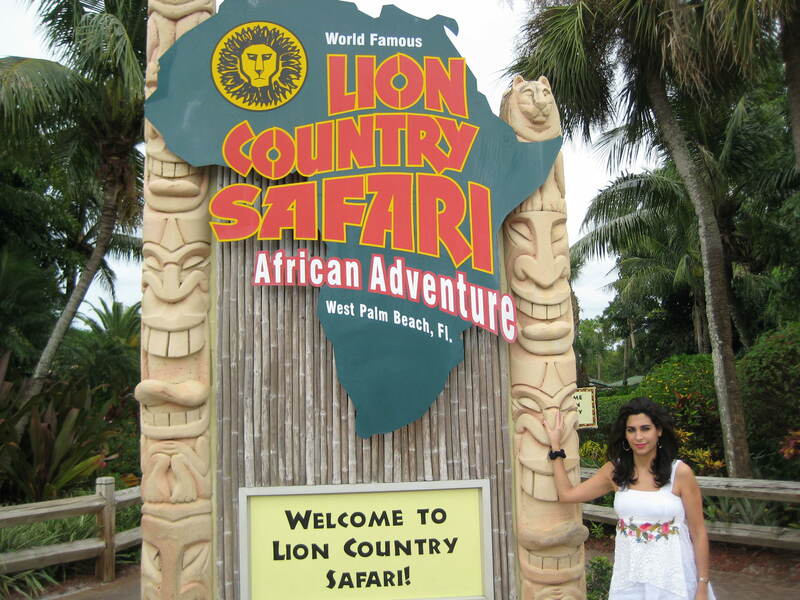 I would recommend visiting this park and to give yourself at least 4 – 5 hours during your visit because Lion Country Safari has something for everyone to enjoy!